The Waterfront Trail stretches over 2,600 kilometres along the shores of Lake Ontario, Lake Erie, Lake Huron, and Lake St. Clair, and the Niagara, Detroit, and St. Lawrence Rivers. It connects 140 communities and hundreds of parks and natural areas. In Toronto, the Waterfront Trail exists mostly through a network of multi-use trails and residential streets. In a few areas, the trail runs along major arterial roads. The long-term goal is to relocate the Waterfront Trail away from these arterial roads, where possible, and provide a continuous route along dedicated cycling lanes, multi-use trails, and quiet streets. A gap in the Waterfront Trail existed in Etobicoke between Norris Crescent and First Street where trail users were required to travel along busy Lake Shore Boulevard West. To connect sections and enhance the safety of the Waterfront Trail in Etobicoke, Council directed staff to study and report back on the implementation of cycling infrastructure along this stretch of Lake Shore Boulevard West, connecting the trail from Norris Crescent to First Street. You can view the report online. The City’s design for the Cycle Track were approved by council in March 2016, and construction was completed in March 2018 in coordination with the TTC Track replacement along the same stretch of Lake Shore Boulevard West. 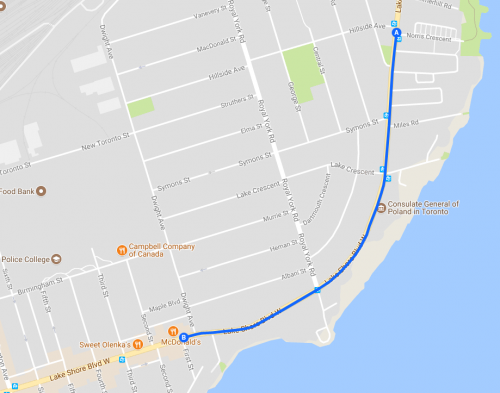 March 2014 – Council motion directs City staff to consider the feasibility and implementation of a bikeway facility along Lake Shore Boulevard West, between Norris Crescent and First Street to close a gap in the Waterfront Trail. April 17, 2014 – Public meeting at the Polish Cultural Centre to discuss possibilities for cycling infrastructure along Lake Shore Boulevard. June 2014 – City staff present an interim report to the Public Works and Infrastructure Committee on the feasibility of the proposed cycling infrastructure. Summer 2015 – Preliminary designs for cycle track and key stakeholder engagement. Fall 2017 – Construction of cycle track begins in coordination with TTC track work. Map of Study Area. Map image attributed to Google Maps. Participants were asked for feedback on the types of bikeways to consider. These included painted bicycle lanes, cycle tracks, contraflow bicycle lanes, and bi-directional cycle tracks. The City also presented the results of the Preliminary Parking Study, which showed that there was low on-street parking usage on the south side of Lake Shore Boulevard West. A second Parking Study was completed in 2015 and confirmed the findings of the Preliminary Parking Study. There was support within the community for connecting the Waterfront Trail using a uni- or bi-directional cycle track. You can view the consultation report. The City hosted a public open house on December 8, 2015 to present the recommended design option for the cycle track, answer questions, and gather feedback. View the final consultation report.